The police arrested the sister and cousin of Jameek Lowery, man whose death sparked a week of protests, on Wednesday morning. 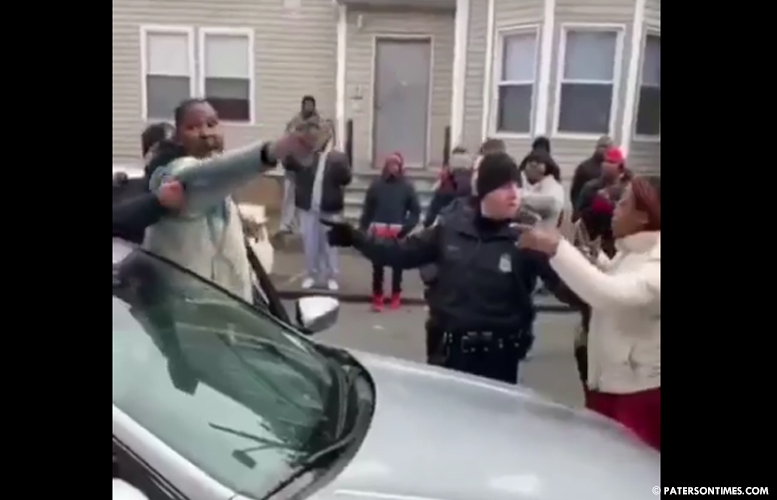 Police charged the cousin, Hanif C. Clyburn, 24, with marijuana possession, obstruction, resisting arrest, making terroristic threats, and inciting a riot. The sister, Jamilyha Lowery, 25, who intervened in the arrest, is charged with disorderly persons offense, according to police. Both were arrested outside of 239 Summer Street. Police were investigating report of someone dealing drugs from a vehicle. Clyburn live streamed a video on Facebook that shows a police officer approached his vehicle and asked for paperwork. “I’m parked, why y’ll pulling me over?” Clyburn tells the officer. He swears and tells the officer he is live streaming the encounter. A police officer asks him for his license and registration. “For what reason?” asks Clyburn. “You got tints,” the officer responds. Police officers smelled odor of marijuana emanating from the vehicle, according to police. Clyburn swears and argues with the officers while having difficulty locating paperwork for the vehicle. The incident attracted a large crowd prompting a big police response. The crowd becomes rowdy leading an officer to use mace. The officer appears to have used mace on Lowery’s mother, Patrice King. Some activists viewed the arrests as evidence of police harassing Lowery’s family members. “I have other kids and your cops and your police officers are harassing my kids,” King told mayor Andre Sayegh on Tuesday night. Five months earlier, police arrested Lowery at the same location. He had 56 glassine envelopes of heroin and 7 baggies of crack-cocaine, according to police records. Meanwhile activists had been preparing to protest Lowery’s death at governor Phil Murphy’s town hall meeting at the Islamic Center of Passaic County on Wednesday night. Murphy had been scheduled to appear at the mosque at 7:30 p.m. for the SiriusXM Town Hall Forum with host Dean Obeidallah, but cancelled the appearance at 3:15 p.m.
Officials said Murphy cancelled due to the unrest that has gripped the city following Lowery’s death. Lowery died on Jan. 6, 2019 following a series of bizarre events. He called 911 early Saturday morning from his home and told a dispatcher he had taken too many ecstasy pills and needed an ambulance to take him to the hospital. He arrived at the hospital, but became “erratic” and left. They probably sold Lowery the fake e-pills that killed him.